Was bored with Trump and Russians when I came upon this piece in the Telegraph. 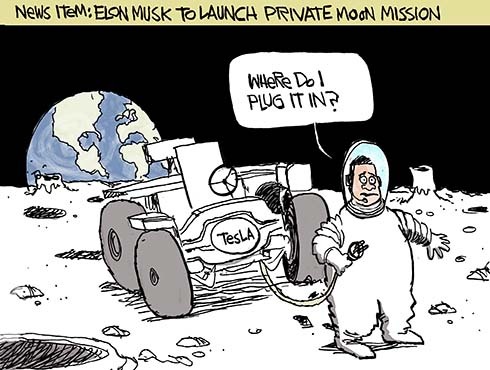 It’s about the private space race. Elon Musk is the owner of Space X. His company plans to send tourists to the moon in 2018. His other company is Tesla. He’ll be competing for the $20 million Google Lunar X prize. The competition includes a team featuring an Audi lunar rover. Couldn’t agree more- we need new topic other than Trump and the Russians, indeed getting quite boring…. Elon Musk always is doing interesting things!! Are you a cult hero? Have to get back to you on that, Boomer. Late for my space ship. I imagine batteries have improved since the Apollo Lunar Rover days.